The method described below cooks rather than preserves fish, so treat the results as you would any other cooked fish. 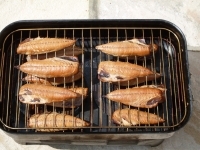 Cold smoking uses a different technique and is used to preserve fish and meat. First catch your mackerel. Keep them cool from the moment they are caught, and cook them as soon as possible. I use a large cool box with several 2 litre plastic bottles filled with water and frozen solid in the bottom. 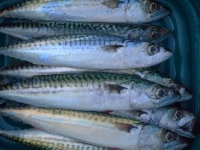 Mackerel placed on the frozen bottles stay in good condition for several hours. 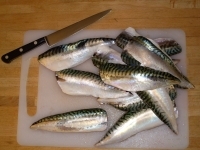 Wash your mackerel in chilled water and fillet them “bait style” – as if you were preparing a side of mackerel for bait. No need to be fussy about bones, they will lift off easily once cooked. Now prepare your brine mix. There are many different versions so feel free to experiment. I like to use the following recipe. This makes a lot but you can keep unused brine in the fridge for a few weeks for use later, or simply scale down proportionally. 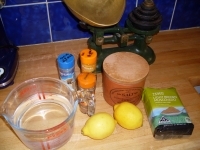 Take 4 litres of water and add 500mL salt, 250mL brown sugar, 75mL lemon juice, 1 tablespoon garlic powder, 1 tablespoon onion powder, 1 tablespoon allspice, 2 teaspoons white pepper. Mix until the sugar and salt are dissolved. 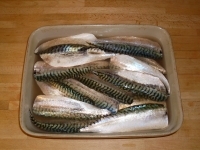 Place the mackerel fillets in a non-metallic bowl and pour in enough brine to cover. Swish them about to make sure they are wet, and leave for 30 minutes in a cool place. Make sure no four-legged creatures can steal them! After 30 minutes, remove the fillets and dry on kitchen towel. For the really best results, you need to air-dry the fillets so they get a good texture in the smoker. I have a fan oven which has a fan-only setting (no heat). This is ideal, and will dry the fillets sufficiently in an hour. Alternatively let them dry in a cool draughty place if possible. The dried sugar/salt crust is called a pellicle. Meanwhile, you can prepare your smoker. I am using a rather battered ABU smoker but there are many other makes available with almost identical features. 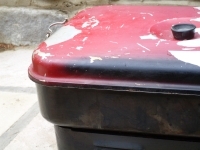 In fact any tin box can be turned into a smoker! You will also need a heat source – many smokers have dishes to hold methylated spirits – and hardwood sawdust or “smoke dust”. You must use clean untreated hardwood such as oak. Softwood such as pine will give a nasty resinous taste. Smoke dust is cheap to buy from the suppliers of smokers. Put a heaped tablespoon of sawdust above each burner. Don’t think it is better with more, it is not! The good thing is, your bag of smoke dust will last for years at this rate of use. 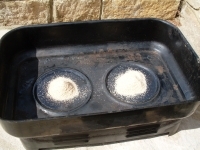 Cover the sawdust with the drip trays to prevent moisture and oil from the fillets dripping on the sawdust and dampening the smoulder. 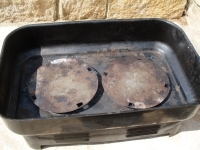 If your smoker doesn’t have them, you can make something suitable from the end of a tin can, with a notch in the side bent down so the lid sits about 1cm above the base. 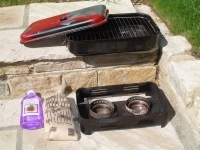 Oil the grill racks as you would a barbie to prevent sticking, and lay the fillets skin-side down on the racks. Don’t over-load the smoker as too much moisture in the smoker will result in mushy fish. This particular smoker has two layers of grill rack. Put the lid on and clamp it down if it has clamps, or weight it with a brick. Fill the burner dishes with meths, then put the cap on the meths and put it well away. Light the meths with a long match and place the tin containing the mackerel on top. 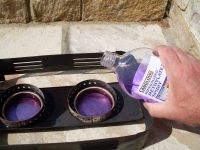 An alternative heat source is a pair of camping gas burners, which is a cheaper option if you plan to do this regularly. 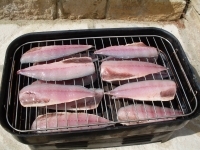 Smoke will start to seep out of the crack under the lid – this is a good sign and shows your mackerel are cooking in smoke. Keep an eye on the flames below, the mackerel fillets need to smoke for 20 minutes so if the burners run out of fuel you will need to add more. Be very careful when filling hot burners! After 20 minutes smoking you can take the lid off. 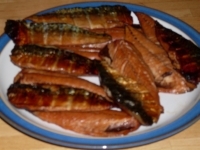 This is what you will see – perfect hot-smoked mackerel. even after several months in the freezer. You can try smoking any fish, oily or white, bony or cartiligeous. 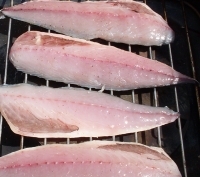 Here I smoked some whiting whole. Brine for a hour as the flavour needs more time to penetrate, then dry as above – this is very important to avoid soggy results. Then smoke for 20 minutes. If you have smaller fish, it is a lot easier to de-bone smoked whole fish than filleting fresh fish, and makes a great base for kedgeree.